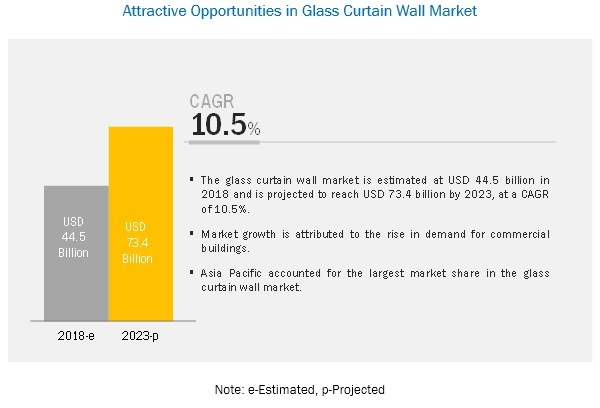 [151 Pages Report] The glass curtain wall market is projected to grow from USD 44.5 billion in 2018, to reach USD 73.4 billion by 2023, at a CAGR of 10.5% from 2018 to 2023. The growth of this market is attributed to the rise in the need for energy-efficient façade systems and strict environmental regulations. In addition, the upward trend in the building & construction industry is projected to contribute to the growth of the glass curtain wall market during the forecast period. In terms of value and volume , the unitized curtain wall segment is projected to lead the glass curtain wall market from 2018 to 2023. Based on system , the unitized curtain wall segment in the glass curtain wall market is projected to grow at a higher CAGR during the forecast period, in terms of both value and volume. The growth of this segment can be attributed to high demand of unitized glass curtain walls in the commercial industry. These curtain wall systems are designed to be external glazed systems of buildings. This framing is attached to the buildings, and hence doesn’t lift or support the floor or roof loads of the buildings. In terms of value and volume, the commercial buildings segment in the glass curtain wall market is projected to grow at the highest CAGR during the forecast period. Based on end use, the commercial buildings segment is projected to lead the glass curtain wall market from 2018 to 2023, in terms of both value and volume. The demand for smooth exterior glass facade on buildings, attractive architectural design, day-lighting, thermal efficiency, exterior exposure of metal framing for water elimination and air infiltration, and environmental control are some of the key factors contributing to the growth of the glass curtain wall market in the commercial buildings segment. These systems provides a protective layer for large-scale commercial buildings and enhance the energy efficiency of the buildings, along with reducing the cost of heating & cooling . The Asia Pacific glass curtain wall market is projected to witness rapid growth during the forecast period. The increase in the demand for glass curtain wall can be largely attributed to the growing infrastructure and building & construction industries. The demand for glass curtain wall is growing rapidly in the region, owing to the high growth in the infrastructure sector for an aesthetic appeal. Asia Pacific is the hub of foreign investments and booming industrial sectors largely due to the availability of low-cost labor and land . . This market is also projected to lead the market, in terms of both value and volume, during the forecast period. Saint-Gobain (France), Asahi Glass (Japan), Central Glass (Japan), Guardian Industries (US), Nippon Sheet Glass (US), AVIC Sanxin Co., Ltd (China), Schott AG (Germany), China Glass Holdings Limited (Hong Kong), Vitro (Mexico), and Xinyi Glass Holdings Limited (Hong Kong) are the key players operating in the glass curtain wall market. Saint-Gobain is one of the largest companies which designs, manufactures, and distributes building and construction materials such as ceramic , glass, plastic , and fiber cement products. It is one of the leading curtain wall manufacturer. The strong global presence and adoption of growth strategies such as acquisitions, partnerships, divestments, and expansion have ensured its leading position in the market. In January 2019, the company opened a new flat glass production line (float) in Sriperumbudur, near Chennai, India; in July 2017, Saint-Gobain SA acquired TekBond (Brazil), the number two adhesive business operating in the construction sector and automotive aftermarket; and in December 2016, it acquired the entire share capital of the Romanian company Pietta Glass to expand in the facade market. In January 2019, Saint-Gobain opened a new flat glass production line (float) in Sriperumbudur, near Chennai, India. This new production line represents a Euro 115 million (USD 130 Million) investment and complemented Saint-Gobain’s industrial glass facilities in India, which also included a float in Bhiwadi (Rajasthan) and another in Jhagadia (Gujarat). In January 2019, Tecnoglass, a leading manufacturer of glass windows and façades in Colombian, took a minority share in the capital of Saint-Gobain subsidiary Vidrio Andino (Colombia). Within the framework of this partnership, Vidrio Andino would build a new float in Colombia to meet the growing demand for glass in this region. In Ocrtober 2018, NSG announced its plan to build a new float glass plant in Argentina. The new plant would support the growing demand for architectural and automotive glass products in Argentina. What are the global trends that are increasing the demand for glass curtain walls? Would the market witness an increase or decline in demand in the coming years? What is the estimated demand for different systems of glass curtain walls? Where will the strategic developments take the industry in the mid- to-long term? What are the upcoming industry applications and trends for glass curtain walls? Who are the major players in the glass curtain wall market, globally? The study involved four major activities for estimating the current global size of the glass curtain wall market. The exhaustive secondary research was carried out to collect information on the market, the peer market, and the parent market. The next step was to validate these findings, assumptions and sizes with the industry experts across the value chain of glass curtain wall market through primary research. Both the top-down and bottom-up approaches were employed to estimate the overall size of the glass curtain wall market. Thereafter, market breakdown and data triangulation procedures were used to estimate the size of different segments and subsegments of the market. In the secondary research process, various secondary sources such as Hoovers, Bloomberg BusinessWeek, and Dun & Bradstreet were referred to, so as to identify and collect information for the study on the glass curtain wall market. These secondary sources included annual reports, press releases & investor presentations of companies, white papers, certified publications, articles by recognized authors, gold & silver standard websites, regulatory bodies, trade directories, and databases. After arriving at the overall market size from the estimation process explained above, the total market was split into several segments and subsegments. The data triangulation and market breakdown procedures were employed, wherever applicable, to complete the overall market engineering process and arrive at the exact statistics for all segments and subsegments of the glass curtain wall market. The data was triangulated by studying various factors and trends from both the demand- and supply-side. To define, analyze, and project the size of the glass curtain wall market, in terms of value and volume, based on system, end use, and region. To project the size of the market and its segments, in terms of value and volume, with respect to the five main regions, namely, North America, Europe, Asia Pacific, the Middle East & Africa, and South America. 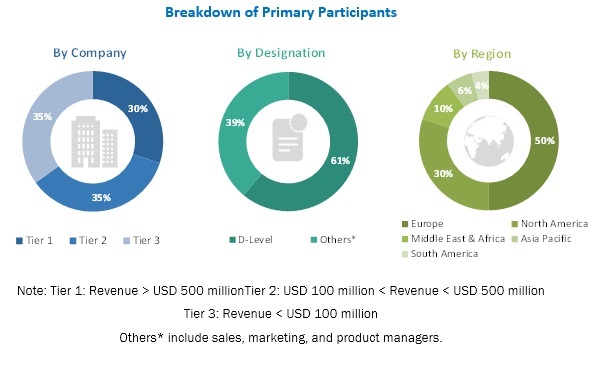 To provide detailed information about the key factors such as drivers, opportunities, restraints, and challenges influencing the growth of the market. To strategically analyze the micromarkets, with respect to individual growth trends, future prospects, and their contribution to the total market. To analyze the opportunities in the market for stakeholders and provide a detailed competitive landscape of the market leaders. To analyze the competitive developments such as acquisitions, expansions, investments, new product developments, partnerships, and agreements in the glass curtain wall market. To strategically profile the key players operating in the market and comprehensively analyze their market shares and core competencies. Total 20 market players are covered in this report. This research report categorizes the glass curtain wall market based on system, end use, and region.